Happy Christmas Jumper Day Everyone! 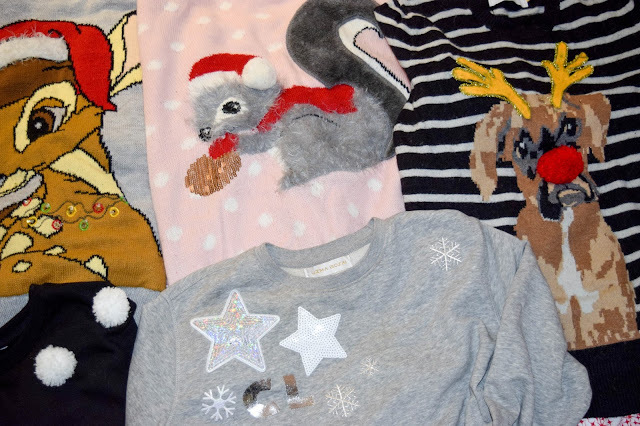 It's officially Christmas Jumper Day and I am bound to be wearing one of these lovely jumpers today. I'm writing this a day in advance so I don't know which one I've picked yet. I'm still deciding between Christmas squirrel or snowy pom-poms. Anyway, today, in the spirit of Christmas Jumper Day, I want to show you what is in my Christmas jumper collection so far. I've been getting at least one new one every year for the last 4 years but I have 7 Christmas jumpers at the moment and I've almost worn every single one already this year. The jumper I want to talk about first is probably the jumper that started it all. 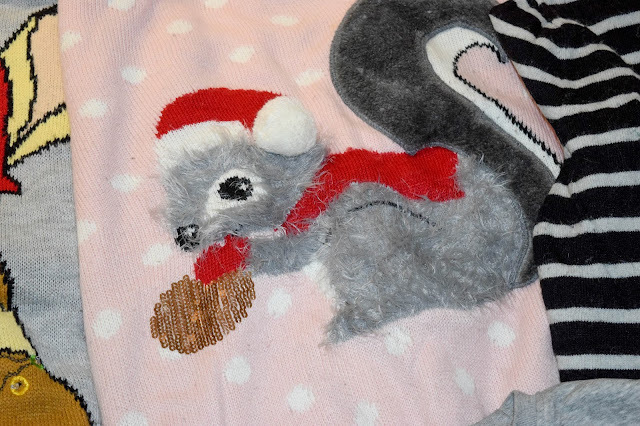 I keep thinking the squirrel was my first Christmas jumper but I think it's actually this one being 2013's Christmas jumper. I vaguely remember feeling a bit weird about getting my first Christmas jumper and wanted something subtle but still Christmassy. 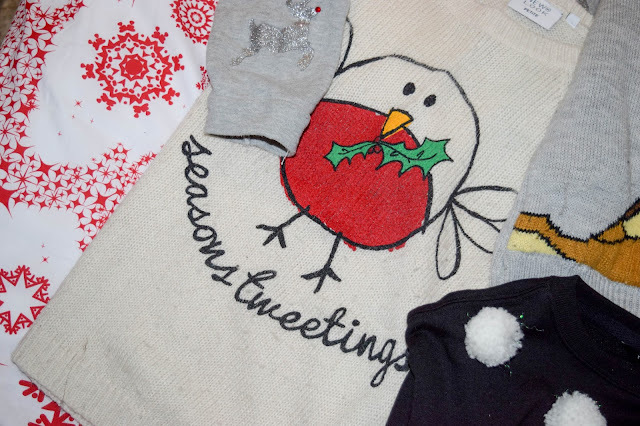 I was big tweeter back then and I remember being drawn to the Christmas/bird pun that I felt suited me at the time. Still an awesome jumper that works well with so many outfits! 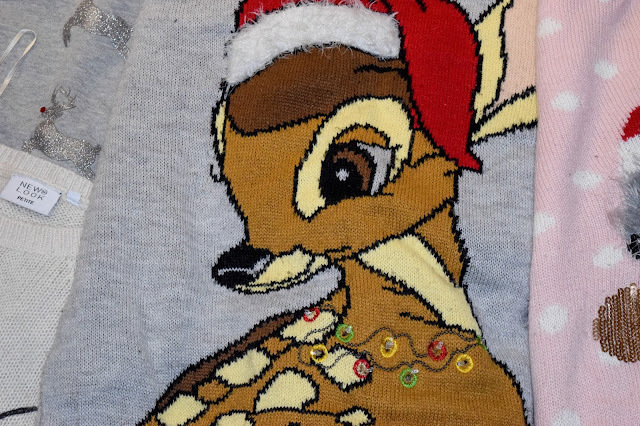 I absolutely love everything about this Christmas jumper. It's the cutest little squirrel and it's fluffy, it has a pom pom, a christmas hat, faux fur... It's just too cute and ever so cosy. I love this jumper and I think it might be a 2013 jumper too. 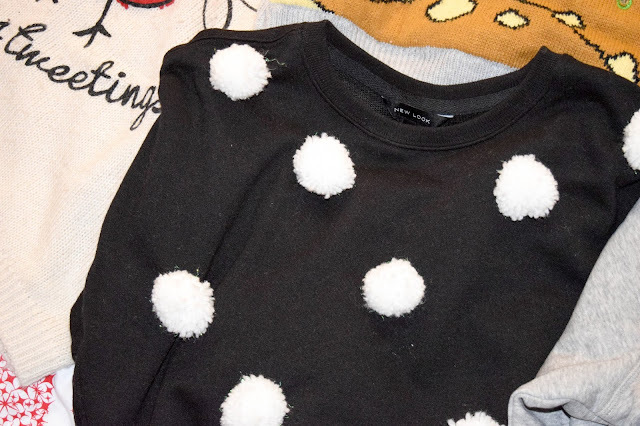 From 2013 I remember having two occasions to wear Christmas Jumpers on, so I needed two. I got this one second and remember not being able to resist it. I definitely got it after the Season's Tweetings one. It's a bit worn down on the sleeves but it's a jumper I wear every year without fail! Next up in my Christmas jumper collection was this beauty and still probably my all time favourite jumper. Because it's Bambi, it's Christmassy and it lights up. This jumper surprisingly has gone in the wash and it still works! I seriously love this jumper and remember wearing it and blogging about it on Christmas Day 2014. It's cosy just like the squirrel one and it's one I always get compliments on. Can you believe they're both from Primark!? Yeah! 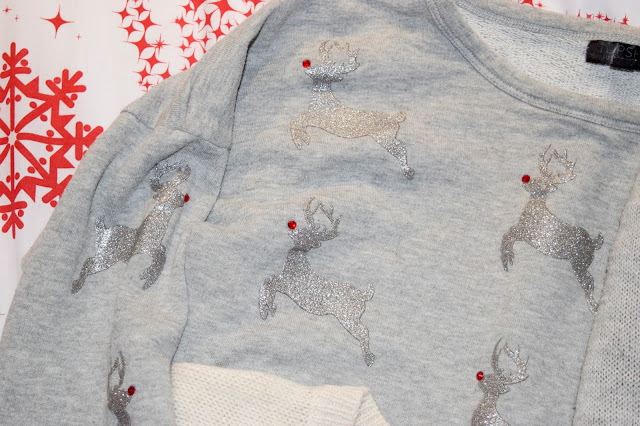 This has to be the Christmas jumper for 2015 because I have a gap and can't figure out when I got this one. This one was from Topshop and a bargain at the time. I remember falling for the subtle glittery reinder with red gem noses. 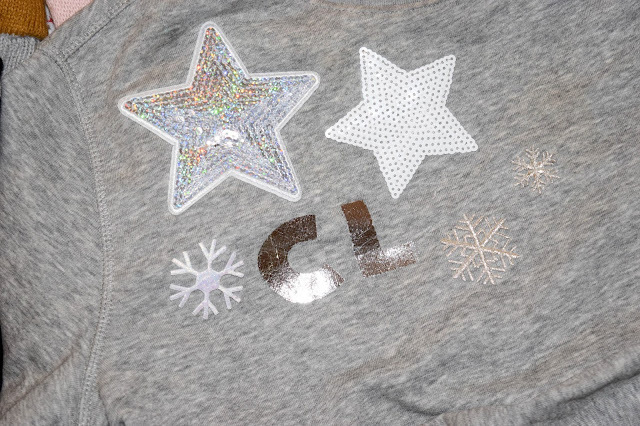 I still love it but it hasn't worn as well as the others, so it doesn't rank high within my Christmas jumpers. It's still to be worn this year actually! My Buster the Boxer Christmas jumper was the jumper for 2016. 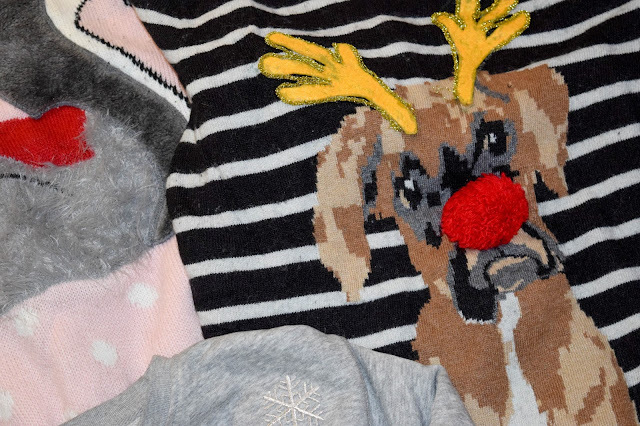 Last year, I was lucky enough to attend an event with John Lewis to customise one of their cute Christmas jumpers and I decided to go for Buster. I stuck some reindeer antlers on him, a big red nose and I have some patches on the elbow. Thing is, is that since I've washed it, it's started to fall apart so I need to do some pronto fixing if I want to wear it this year. This jumper is one of my latest additions to the crowd for 2017 and was made by yours truly at the Pandora Christmas Market event back in November. It was so much fun to make and I absolutely adore this jumper. I wore it out for the first time the other day and I got so many lovely compliments on it. The personal touch with the initials is so much fun. I really enjoy it and now that I know how to do it, I feel like I'd like to make more jumpers like this. The other thing about this jumper is that it's really nice and casual. You could just say it's a wintry jumper rather than a Christmas one which I find appealing. It means I could probably wear it long after Christmas is over when it's cold and when I need something cosy to wear. The final addition to my Christmas jumper collection this year was this snowy pom pom jumper I made. Instead of going on about this, I'm going to link you to the post all about how I made it. I'm yet to wear it out but I'm saving it for a good day. I think today is a great occasion but of course, writing a day early I don't know which one I've settled for. Like I said before, it's likely to be this one or the squirrel though. Anyway, I have my favourite. But what's your favourite? 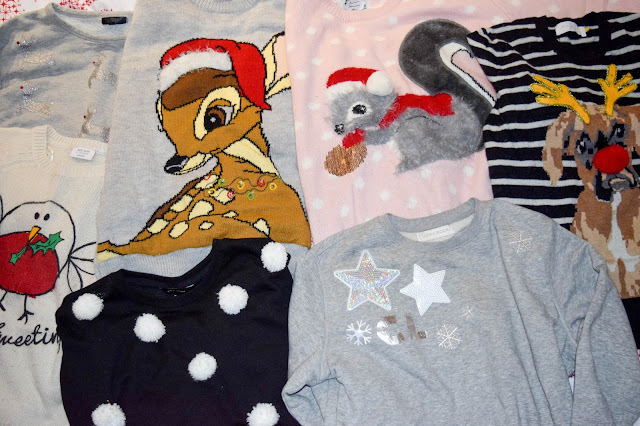 Also let me know what jumper you'll be wearing for Christmas jumper day today! 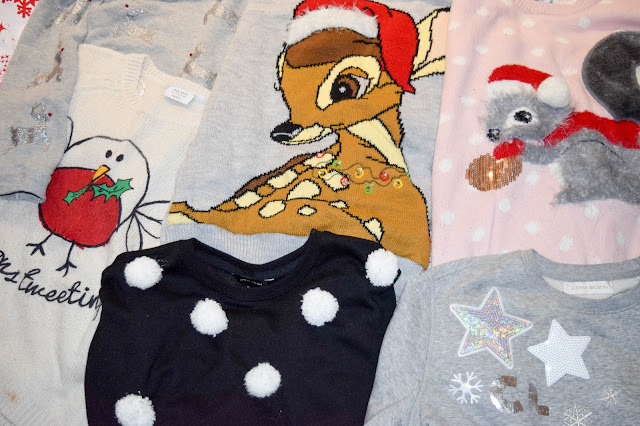 Although Christmas Jumper Day is a lot of fun and a great opportunity to wear a crazy Christmas jumper, it's also an opportunity to raise money for Save the Children. You can donate on their website or get involved where you can all over the country today.